What’s slowing the use of robots in the ag industry? Why are so many farm equipment manufacturers so heavily involved in the ag industry yet things are going so slowly in relation to robotics? Perhaps farmers need to first incorporate the digital era — and the concepts and practices of precision agriculture — before taking the next step toward the use of robots. Two traditional qualifiers for farmers buying new equipment are flexibility and return on investment. Precision agriculture isn’t just rhetoric; it’s real-time intelligence flowing into analytics software that transforms that flow into meaningful, practical information that farm managers can react to quickly. That data — and that process — have costs and, for the last few years, farmers have been stretched because commodity prices are down. But changes effecting labor, water, commodity prices and politics are speeding up the need for significant automation in the already heavily automated agriculture industry while technological improvements are speeding up, particularly in the areas of vision systems, perception and grasping. Deere is a global provider of tractors and farm implements, has a small line of autonomous “mules” and other robotic vehicles mostly for the military, as well as robotic lawnmowers for the consumer market. Deere has built an autonomous cab-less tractor, but it hasn’t been accepted by farmers who prefer their air-conditioned cabs and mobile control consoles. Nevertheless, 60% of Deere tractors come equipped with self-steering kits. Deere’s recent marketing push is in variable-rate towed or pulled farm implements. Deere saw 2016 sales drop 8% from 2015 (which was also a down year). They attribute the slump to lower equipment sales resulting from difficult conditions in the farm (90%) and construction equipment (10%) markets. As a result, Deere sales of large ag equipment have dropped over 50% in the last 3 years. Equipment continues to get larger and more powerful, but its value is increasingly being determined by its technology and advanced capabilities. That’s why Deere is committed to becoming the industry’s undisputed leader in precision agriculture. Today, customers can monitor and measure crop yield, moisture content, or seeding population in real time as their machinery moves along in the field. This data can be used to generate prescriptions for planting seeds and applying fertilizer or pesticide with more accuracy. That helps farmers manage costs and increase their revenue through improved productivity and higher yields. The results can be pretty impressive. Trimble is a large provider of GPS technology for field and mobile workers in all disciplines. Their ag division integrates, provides, and sells a wide range of driverless-steering kits, prescription mapping systems, in-field guidance software and devices, and also sells various types of drones, GPS/RTK services and communication equipment, spot spray systems, a wide range of sensors and their Connected Farm Management System. Trimble’s 2016 sales grew only 3% year-over-year. Ag revenue can’t be separately identified because of the way they report their income, however, Trimble’s navigational guidance products for all brands of ag equipment are their primary revenue along with their new, consolidated, precision ag software platform called their Connected Farm Management System, and their drone data collection system. Trimble resells through CNH dealers as well as their own staff and has multiple ag-related products in addition to those mentioned above including speciality software and sensors for leveling and variable-rate watering applications. Raven is a provider of engineered films such as those used in agriculture as plastic sheeting and silage covers, and components and software for RTK communication, steering and guidance. Raven also makes components for variable-rate dispensing devices such as nozzles for sprayers and controllers for multiple nozzles on a sprayer arm. Raven’s 2016 sales grew 7.8% over 2015 revenue which was down -34% from 2014. Agricultural products represent approximately 38% of Raven’s revenues. CNH Industrial is a global conglomerate of construction, lift, truck, power-train and agricultural tractors and equipment. CNH is a recent combination of multiple brands (Case, New Holland, Intl Harvester, Steyr, Iveco and many more) under a single umbrella. CNH has more than 100 product lines and over 400 models of tractors, harvesters, material handling, seeding and other ag equipment. CNH regularly equips tractors with AccuGuide communication software and systems with section and rate control to enable variable-rate fertilizing, seeding and navigational guidance for repeatable accuracy at sub-inch levels. CNH also offers self-driving kits for their tractors and approximately 60% of tractors sold include that feature. CNH is a funding and consortium member in a variety of sensing and manipulation projects under the EU’s Clever Robots for Crops program. These include a sweet-pepper harvesting robot, an apple harvesting robot, precision and canopy optimized spraying robots and other AI-based ag systems, none of which are currently available commercially. All of the equipment makers — John Deere, AGCO (including the Massey Ferguson, Fendt, Valtra and Challenger brands), Claas, the Argo Group (including the Landini, McCormick and Valpadana brands), the Same Deutz Fahr Group (including the Same, Lamborghini, Hurlimann and Deutz brands), CNH Industrial and Kubota — plus Trimble, Raven and all the other support businesses, are projecting a slow but steady progression toward the acceptance of precision ag products, software, equipment and practices. Only then will they push to add robots to the process. All of these companies are fighting to retain profitability while current demand is slow. 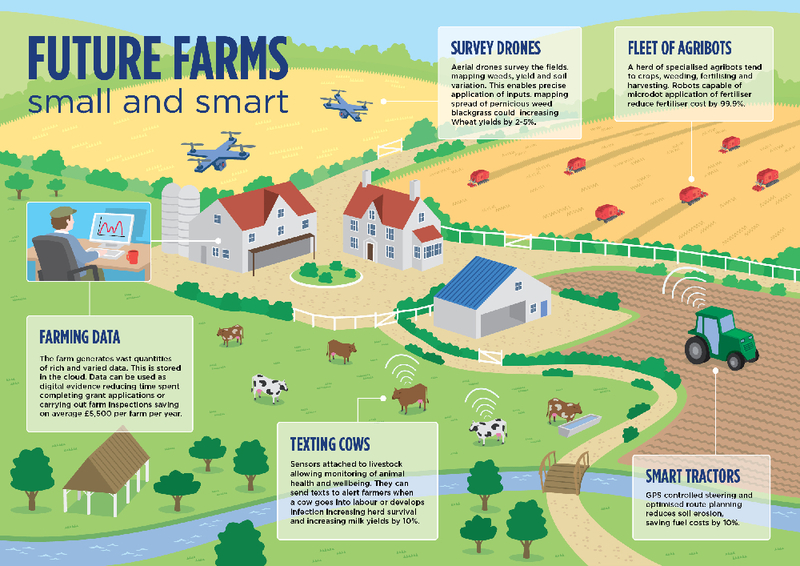 Nevertheless, they are providing incremental solutions that help farmers become digital precision farmers, i.e, connected farmers with streaming data flows from all over the farm and aggregating that data into software applications and platforms from which localized farming decisions can be made. Once farmers begin to use their data to make those decisions, they will need variable-rate machines to execute them, at which time they will want and need to use robotic devices. At present, there is an upsurge in post processing robotics, i.e., in sorting, inspecting, deleafing, packaging, boxing and palletizing performed at packing houses and co-ops. Newer robotics such as seeding, weeding, variable-rate spraying and harvesting are still being field tested and are presently too expensive and untried for general deployment. Deere, Raven and Trimble are members of the 80+ stocks included in the ROBO Global Robotics & Automation Index, a leading indicator of the robotics and automation market. CNH and many others are, for the time being, less robotically-involved. For more information about the index or the 80+ member companies, go to ROBO Global’s website.